Who hasn’t admired the full moon hanging like a shimmering white pearl? How often have we imagined the shapes and shadows on the moon to be animals, people, or even old gods? It is no wonder that moon worship has been practised throughout the world for centuries. The Mid-Autumn Festival, the second most important festival in China, evolved from this concept of moon worship. It is a 3,000-year-old harvest festival that takes place on the 15th day of the 8th month according to the Chinese lunar calendar, meaning it falls sometime between September and October. It always falls on the night of a full moon, earning it the names Moon Festival, Mooncake Festival, and Harvest Moon Festival. In the past, the festival celebrated three main concepts: gathering, thanksgiving, and praying. Families and friends used to gather together after harvesting the crops. They would give thanks for the harvest and for the harmonious relationships between them. Then they would pray for a good harvest in the following year and for other, less tangible ideals such as good fortune, longevity, and marital bliss. Thus nowadays the Mid-Autumn Festival is considered a time for families to come together in quiet appreciation for what they have, much like Thanksgiving in America and the Harvest Festival in England. During the festival families will share moon cakes, admire the full moon, and burn incense. The moon’s round shape symbolises family unity and so, even if you can’t make it home, it is considered pertinent to admire the moon alone and think of your family. This way, if you and your family are looking at the moon at the same time, you are both connected. If you want to take part in this peaceful and spiritual festival, there are plenty of places that hold outdoor group activities across China. Many of the parks and tourist attractions in Beijing, Shanghai, Guilin, and other major cities will hold a myriad of exciting activities including dancing, letting off sky lanterns, serving delicious festival food, and playing delightful games such as “chasing the moon”. With the full moon above you and the laughter of happy families pervading the night air, the atmosphere on Mid-Autumn Festival is truly magical. The festival is often attributed to Chang’e, who is sometimes referred to as the Moon Goddess of Immortality. According to legend, there was once a hero named Hou Yi who was an accomplished archer. One year, ten suns rose into the sky and brought catastrophe to earth. They scorched the plants, dried up the rivers, and caused the death of many people. With great skill, Hou Yi shot down nine of the suns and left only one to provide light. The people rejoiced and, as an act of thanks, the Queen of Heaven bestowed on Hou Yi an elixir of immortality. Hou Yi wanted to become an immortal but he loved his beautiful wife Chang’e too much to leave, so he gave her the elixir for safekeeping. Hou Yi’s fame earned him many followers who wanted to learn from him. Most of these followers were in earnest but one, Peng Meng, only wanted to steal Hou Yi’s elixir. One day, when Hou Yi went out hunting, Peng Meng broke into his house and demanded that Chang’e give him the elixir. She knew she couldn’t overpower him so, in an act of desperation, she drank the elixir herself. As she floated towards heaven her love for her husband kept her tethered to earth, and so she ended up on the moon, which is the closest place in heaven to earth. When he returned from hunting, Hou Yi’s servants told him what had happened. He mourned the loss of his wife but, as he looked up at the moon, he noticed her figure dancing on its surface. In his courtyard, he set up a table adorned with all of the cakes, fruits and treats that his wife loved most and offered them to her. The local people were so touched by his enduring affection for his wife that they too began making food offerings to her. This custom has endured for many years and nowadays Chinese people will still pray to Chang’e for good fortune and safety. Alongside Chang’e, you’re sure to find her trusty companion, the adorable Jade Rabbit. The legend goes that one day three immortals came to earth and asked a rabbit, a fox and a monkey to find them some food. Both the fox and the monkey returned with ample provisions, but the rabbit wasn’t able to find anything. Out of shame and guilt, he threw himself onto the fire and begged the immortals to eat him instead. The immortals were so moved by this act of selflessness that they bestowed immortality on him and allowed him to accompany Chang’e in the moon palace of Guanghan. 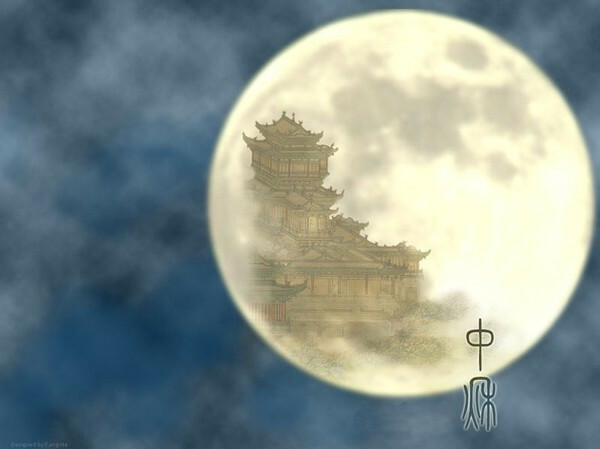 If you look closely at the full moon, you can see the image of the Jade Rabbit pounding herbal medicine for the immortals. The third and final figure associated with the moon is Wu Gang; a woodcutter who desperately wanted to achieve immortality but was too lazy to take any steps to this end. Wu Gang’s attitude enraged the Jade Emperor, who concocted a plan to torment the poor woodcutter. The Emperor planted a cherry bay on the moon, which was over 1,500 metres high, and told Wu Gang that, if he managed to cut the tree down, he would be granted eternal life. Wu Gang worked tirelessly, but to no avail. Each time he got close to cutting it down, it would heal itself and he would have to start all over again. On a clear night, some people say you can still see him hacking away at the cherry bay. Moon worship in China can be traced all the way back to the Shang Dynasty (c. 1600-1046 B.C. ), while several of the festival customs appear to date all the way back to the Zhou Dynasty (c. 1045-256 B.C). However, these customs were only observed by the royal class during the Autumnal Equinox. By the Sui Dynasty (581-618 A.D.), the common tradition of moon worship intermingled with these royal customs and by the Tang Dynasty (618-690) they had fused to form a ceremonial moon appreciation day. The date for the Mid-Autumn Festival was fixed during the Tang Dynasty and by the Northern Song Dynasty (960 – 1127) the festival was widely celebrated throughout China. Historically, the most popular legend connected to the festival concerns the Han uprising. During the Yuan Dynasty (1271-1368), the Han army wanted to overthrow the ruling Mongols but had no way of communicating their message without it being discovered. One day Liu Bowen, a Han military counsellor, hit upon a brilliant idea. He asked his soldiers to tell the Han commoners that winter would bring an awful disease and that eating moon cakes was the only way to protect against it. He then had the soldiers conceal the message “uprising on the night of the Mid-Autumn Festival” in all of the moon cakes and sold them to the Han commoners. On the night of the festival, the Han uprising succeeded and they defeated the Mongols thanks to the ingenuity of Liu Bowen. He was lucky the moon cakes weren’t too delicious, or else the Han people would have just eaten the message! The main customs practised during the festival are burning incense and making food offerings to the immortals, eating moon cakes, drinking cassia wine, lighting lanterns, and performing the lion or dragon dance. Incense will normally be burned for the immortals Chang’e and the Jade Rabbit. A table will be laid out with a number of food offerings, including several fruits, cakes and flowers. The most important sacrificial foods are moon cakes and watermelons, and a clay statue of the Jade Rabbit is normally placed alongside the food. Considering the rabbit once sacrificed himself, it’s surprising he doesn’t find this act a little offensive! 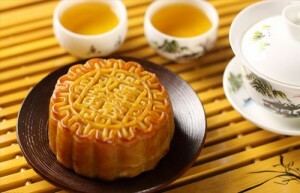 Moon cakes are small, elaborately decorated pies that people present to their friends and relatives as gifts. In the past, families would stay up on the night before the festival making them, but nowadays they can be purchased from most bakeries. They come in a variety of different flavours depending on which region you’re in, but the most common fillings include lotus seed paste, sweet bean paste and egg yolk. They will normally have the name of the bakery and their ingredients imprinted on them, with other designs including images of Chang’e and the Jade Rabbit. The round shape of the moon cake symbolises completeness and unity, so the giving of moon cakes promotes harmonious relationships between family members and friends. They are delicious but also rather dense, so be careful not to eat too many or you may end up as round as the moon! The lighting of lanterns on this festival is not to be confused with the Lantern Festival on the final day of the Chinese New Year. On Mid-Autumn Festival people will carry lanterns, float sky lanterns, or in some cases even write riddles on them. The lanterns don’t appear to be connected to the festival itself, but seem to have been transmitted from other festivals over the years. Most researchers believe that the lighting of lanterns on Mid-Autumn Festival was taken from the Ghost Festival, where lanterns would be placed along the river to guide the spirits of the drowned. From the moist and tasty moon cakes to the colourfully painted lanterns dancing in the sky, the Mid-Autumn Festival is a time to soak in the true beauty of autumn. The Chinese believe that, no matter where you are in the world, if you and your loved ones are both looking at a full moon then you are somehow connected. We feel that this poignant sentiment perfectly describes both the festival and its message of unity.